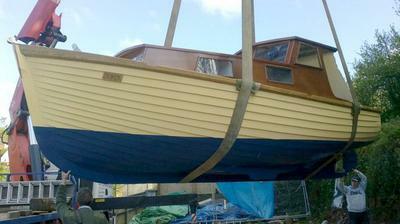 Well it is all done and she is now afloat well at least when the tide is in. 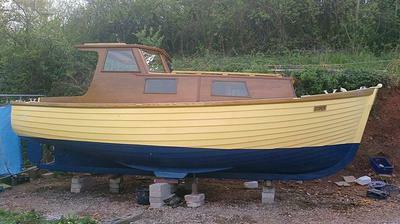 She is finished (that is the most ridicules statement I have ever made) if you know anything about boats. They are never finished, I guess you might say in a ready to use condition. The crane was supposed to come on Tuesday but they had to cancel due to the previous job going on to long so they turned up at 7pm Wednesday. She went in about 7.45pm at this stage panic set in but to my surprise she did not take as much water as I thought she might being that she was out of the water for two years had some new planks in the bottom and been pulled about. So I was over the moon. 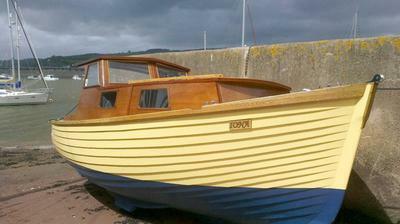 I even arranged to leave her on a quay wall for a couple of tides just in case but that was not needed. 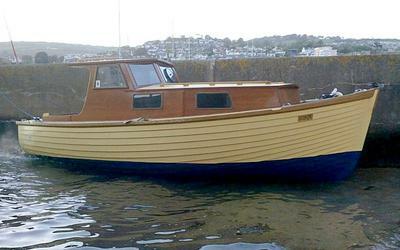 So I am taking her out to her mooring this evening.